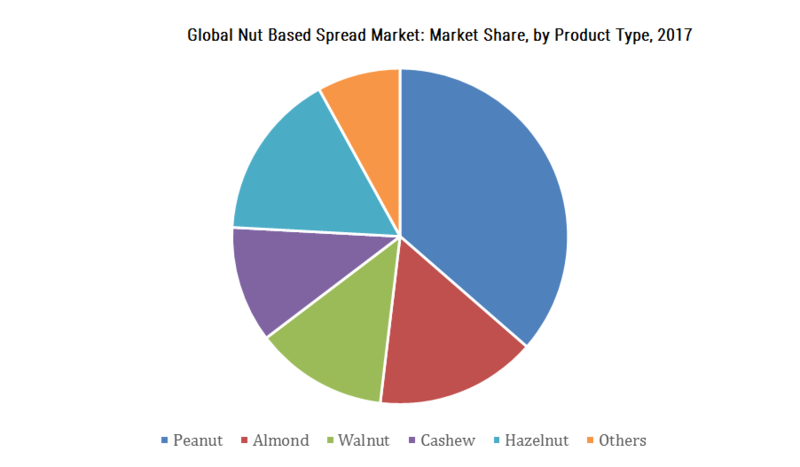 Global nut based spread market is expected to register a CAGR of 6.9% during the forecast period, 2018 to 2023. Globally, nations like United States with their stagnant retail sales of bread, account for the major consumers of nut-based spreads. These spreads are mainly prepared from peanuts, almonds, cashews, walnuts and others. Spreads are mostly consumed at the breakfast, or at other occasions, and are combined with whole-grain food products like bread, toast, or bagels. Peanut butter has led the way for other nut-based spreads like almond, cashew, macadamia nut, coconut, and walnut to enter the industry and offer a wider variety of spreads for consumers. A peanut butter blend that's not only packed with savory flavors, creamy-crunchy textures, and next level nutrients, but also some majorly feel good vibes too. NuttZo 7 Nut & Seed Butter is an organic and family-run company. The spreads are available in various options, viz. Peanut Pro (peanut-based), Chocolate Peanut Pro, Power Fuel (almond-based with no peanuts), or Power Fuel Chocolate flavor, along with a choice of a creamy or crunchy texture. Natural food brand, Whole Earth, expanded its UK range with the launch of a new almond butter which is incidentally its first non-peanut based spread. The brand aims to target health conscious consumers who are looking for a spread high in protein and fibre. The new product is the latest step in Whole Earth’s Nature’s Wonder-Fuel campaign, which focuses on supporting healthy lifestyles with natural products. Nut based spread industry is highly competitive with private labels providing competition to major brands, in terms of product innovation as well as price. Apart from the well-established brands, there is also a significant rise in the number of country-specific local brands offering similar products at a more competitive price. This is leading to more competition in the market. Higher competition is also forcing many established international brands to differentiate their products from its local producers, leading to product innovation in the market. Higher competition in the market is also leading to higher affordability of nut-based spreads in the market due to falling prices. Higher affordability is also increasing the consumer base. Today, nut-based spreads have become a necessity in many developing and developed countries because of low prices and higher preference for the product among the middle classes of various nations. With increase in private labels and super market brands in nut-based spreads, the consumers are able to switch easily from traditional products and brands without compromising on taste or quality. Consumers are constantly looking for healthy snacks made from natural ingredients. Hazelnut butter brings great opportunities to help product developers who are looking for protein-rich foods from a plant-based source. By using natural nut butter, companies can provide much-demanded clean label to the consumers. Hazelnuts contribute significantly to the chocolate and nut spreads taking over the market, with continued promise of growth. Consumers seek natural, healthy varieties of nut-based spreads while still making room to indulge. Today hazelnut butter is finding its way towards cakes, bakes and crackers; and is becoming part of healthy and indulgent lifestyle. The success of sweet spreads such as Nutella has attracted brands both within and outside of the segment to join the chocolate-hazelnut spread craze. Future growth of the category will rely on product innovation, expanded usage occasions, and a focus on new audiences, including ethnic consumers. North America is the largest market with a stake of 29%, followed by Europe. Asia-Pacific is the fastest growing market due to its adaptability to westernization and rising standards of living. The North American market for nut-based spreads is well established and its self-sufficient production capabilities have made it a matured market. Products manufactured are available in various flavours and in forms like liquids or solids. The market mainly consists of spreads, with nut-based spreads being of maximum utilization. It is historically rooted in the American culture and is a part of the American breakfast. 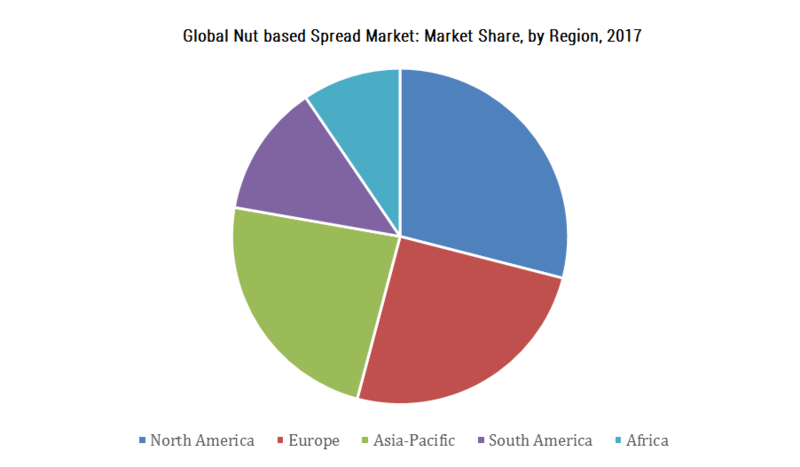 The global nut-based spreads market is highly concentrated by few large players acquiring nearly 64% of the market share. These major players are investing in launching new and innovative products and improvisation of products. Their major strategy is to acquire smaller players and thus increase variety of offerings on their product portfolio. Majority of investment is focused on research and developments to launch new products at prices cheaper than competitors. Major Key Players: JM SMUCKER’S, KRAFTS FOODS GROUP, CONAGRA FOODS INC., HORMEL FOODS CORPORATION. Analyzing outlook of the market with the recent trends and Porter’s five forces analysis.